With fond memories of the Talenti Vanilla Bean pop behind us, it's time to dig into the other two flavors they sent over. Now there are 8 flavors in all, but coffee does not interest me and junk food guy already reviewed coconut (thankfully), so that leaves five more flavors to choose from. Hmmmm, tough call, so I decided to pick one for my wife, and the other for you guys. 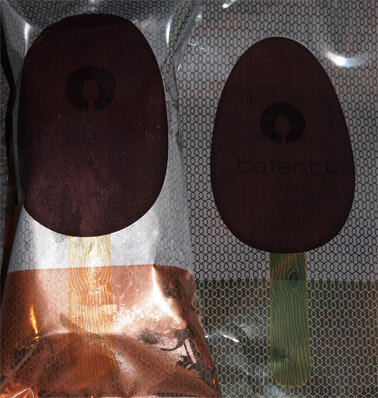 These are the new Talenti Banana Chocolate Swirl gelato pops. 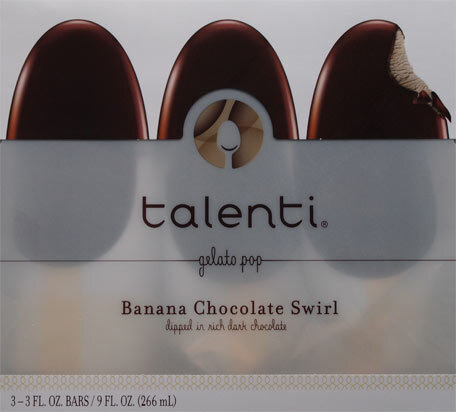 My wife was a big fan of Talenti's banana chocolate swirl gelato (my review), and banana flavors are pretty rare, so all three of these are for her (minus a small sampling for me anyway). 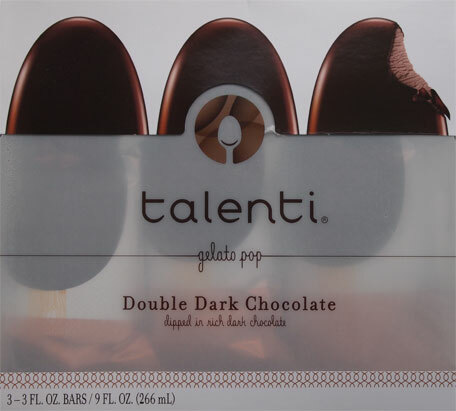 For you guys, I overlooked my beloved mint Talenti and went with the double dark chocolate pops. It's been three years since I first tried their double dark chocolate gelato, so it will be interesting to see if my tastes have matured since then. Neat. Notice how the bottom is orange on the chocolate and yellow on the banana (same as the vanilla). It's not a full on labeling, but I appreciate the difference. That and I love the wrappers.... ok, technically I like shiny things in general, but it's cool, kind of retro, and I dig it. Sure Magnum wrappers are shiny too, but I think the little artsy touches set this wrapper apart. But on the inside, not so much. This is the banana flavor and you can see a bit of caramel swirl on the top half. The good news (for some) is that this tastes just like their banana gelato. The bad news (for me) is that this tastes just like their banana gelato which was well done, but way too strong for my liking. Oh well, more for my wife! 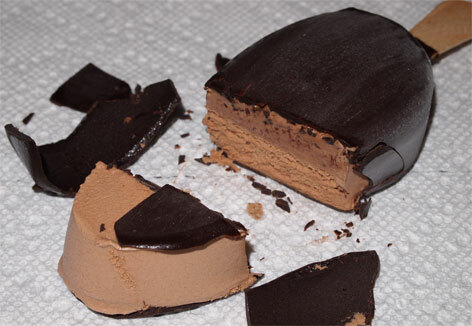 And this would be the dark chocolate gelato... enrobed in dark chocolate... mmmm, so tempting. Notice that neither of these flavors have those great mini chocolate flakes like their gelato pint counterparts, but it doesn't matter when you've got this wonderful dark chocolate shell to distract you. 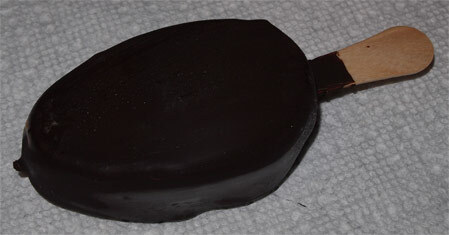 Wow, this is a mighty chocolate pop. Granted it's very dry when paired with the dark chocolate shell, and I'm gonna need a drink afterwords, but it's still wonderful. The dark on dark is just amplifying each other and it's addicting. If push came to shove, I'd say I prefer the vanilla pop, but this is still very cool and it needs you guys to try it. Note: I've been thinking about the nutritional info and it makes me realize that they must lighten up their formula a bit before sticking it in the pops. 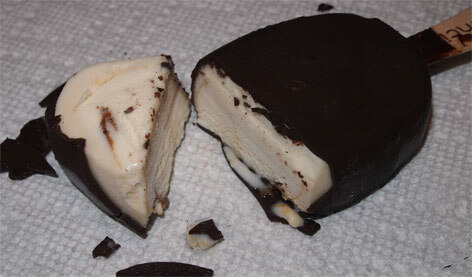 I'm not complaining, it's just very cool how it's soft and easily melts in your mouth like the chocolate shell. The hardest part of these pops is fighting the urge to devour them.